SG Flensburg-Handewitt survived a comeback from RK Celje Pivovarna Lasko to take an important two points on the road to the VELUX EHF Champions League Last 16 on Wednesday night. The match could have gone either way, as the score stood level in the final minutes before a penalty from Hampus Wanne earned the home side the win. Without their head coach Maik Machulla, who was ill, and also injured Swedish playmaker Jim Gottfridsson, Flensburg managed to avenge the 20:23 away defeat to Celje in Round 3. At the same time, the German champions took a significant step towards the Last 16 – though the match was not decided until Hampus Wanne scored the winning goal off a penalty on the buzzer. Celje benefited from a slightly shaky start from Flensburg to take an early 3:1 lead, but the home team did not need long to take control. Four Flensburg goals in a row turned a 4:2 deficit into a 6:4 lead, and Flensburg also pulled three ahead at 8:5. Several great saves from Klemen Ferlin in the Celje goal allowed the visitors to hang in for a while, but at the half-time buzzer, Flensburg were four goals in front. 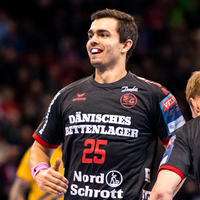 Flensburg opened the second half by increasing the gap to five goals, at 17:12, before an aggressive defence enabled Celje to come back into the match. With less than four minutes left, they equalised at 25:25. From then on, the match stayed even until Wanne’s penalty goal. Flensburg remain third in the group, now with 12 points, while Celje stay in seventh with seven.